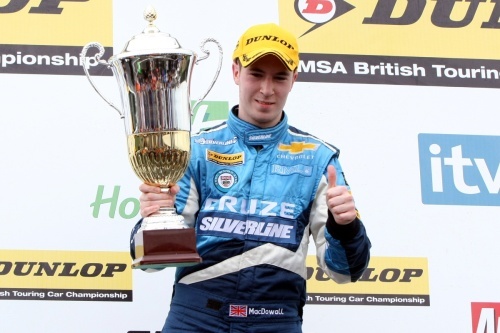 Rising Star of the Dunlop MSA British Touring Car Championship Alex MacDowall made a welcome return to the podium at Knockhill in Scotland on Sunday, 5th September, with a season’s best second place finish during the first of the weekend’s three encounters. Scorching to the second pole position of his maiden season in the BTCC with an absolutely superb performance on Saturday, the Carlisle-based 19-year-old looked well placed to try and challenge for his first victory in the UK’s premier championship. Alex did the unthinkable in qualifying by denying Gordon Shedden – the son-in-law of Knockhill Circuit owner Derek Butcher – pole position with a sensational lap of 53.001 seconds (86.35mph). It also set a new benchmark qualifying time for touring cars at the Fife track, bettering Darren Turner’s previous best. Putting him in the best possible spot on the grid for round 22, Alex did get away fairly well at the wheel of his Chevrolet Cruze but Shedden managed to nose ahead into Duffus Dip for the first time and, try as he might, the Cumbrian teenager wasn’t able to make a breakthrough. Although quicker than the race leader, as proven when he set the fastest lap on the eighth tour with a time of 53.313 seconds (85.84mph), Alex had to constantly keep an eye on his mirrors as Shedden backed-him-up into the sister Honda Civic of third placed Matt Neal. Handling the pressure of two separate Safety Car periods well, Alex continued to shadow Gordon while managing to keep Matt at bay and ended the race just 1.5 seconds shy of the top step of the podium but four seconds clear of Steven Kane, the latter having passed Neal in the closing stages. Lining-up on the front-row of the grid again for round 23, by virtue of his race one result, Alex wasn’t able to make any progress from second place and slipped to seventh by the time he reached the first turn. Almost anticipating the start too soon, as he stopped his Chevrolet from moving forward Alex was caught-out when the lights did change and his car struggled to get moving. Retaining a very sensible approach, he moved to the left to ensure he wouldn’t be in the way of the cars threading their way past as he struggled to get up to speed. The Safety Car was then deployed almost immediately due to a collision at Scotsman on lap one with the race re-starting on lap nine. Running in seventh place, Alex was then pushed wide at the chicane at the conclusion of the first racing lap and he subsequently dropped to the tail of the top 10. On the penultimate lap he then moved back into ninth when Paul O’Neill slipped back after contact with Steven. For the final race of the weekend, round 24, Alex started on the fifth row but instantly gained a place when Steven was forced to pit after the formation lap. Initially dropping back to 10th spot, he moved back into ninth on the opening lap and then took eighth again when Gordon carried too much speed through the chicane and pitched himself into a spin. Following a five-lap Safety Car period to recover a car from an unrelated incident, racing resumed and although pushed back to 10th over the first couple of laps be fought back into eighth before the finish to round-out the biggest points-scoring weekend of his maiden season in the BTCC – a score of 20 points helping Alex close to within just five of the coveted championship top 10.